Amazeballs, no? The biggest difference is the ceiling height. 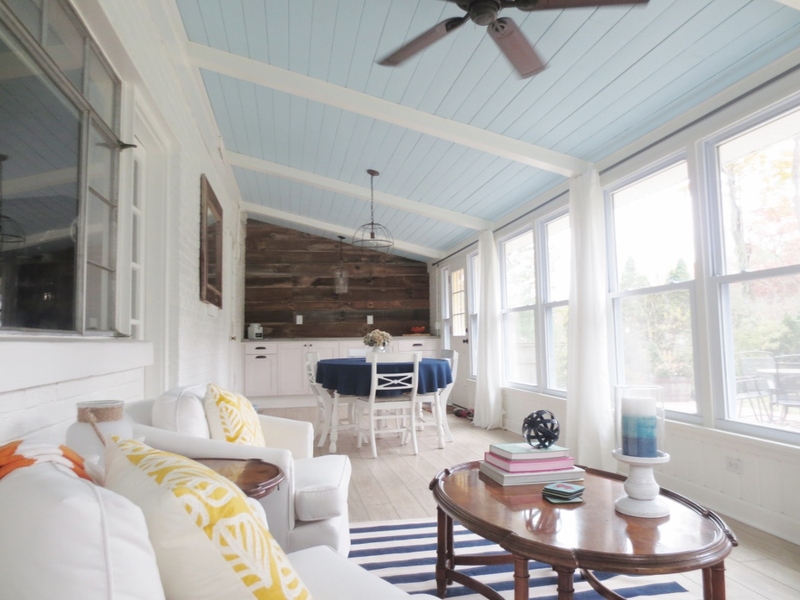 Pitching the roof to go from a 7.5′ flat ceiling to an angled ceiling with a height of just over 9′ on the high side made the room feel not only bigger, but less like porch and more like a room. 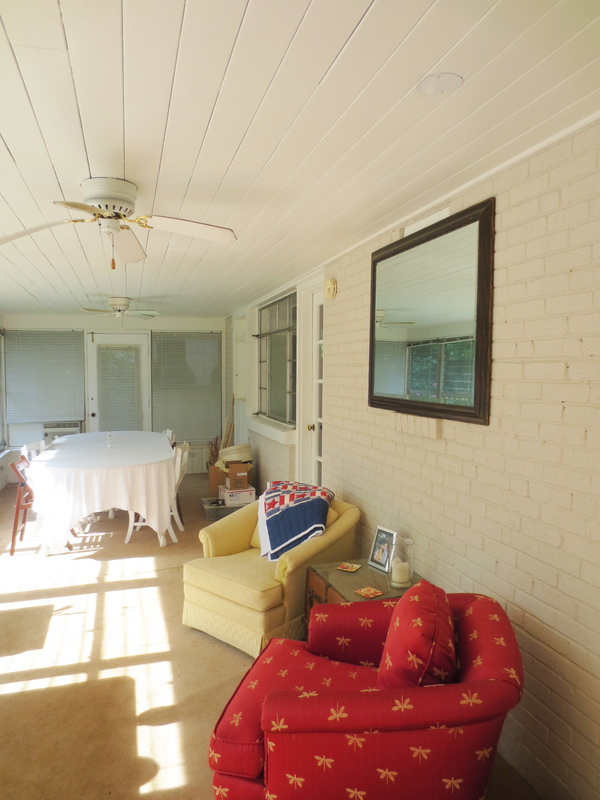 Once the initial demo of the room was done, this was the first project we tackled. 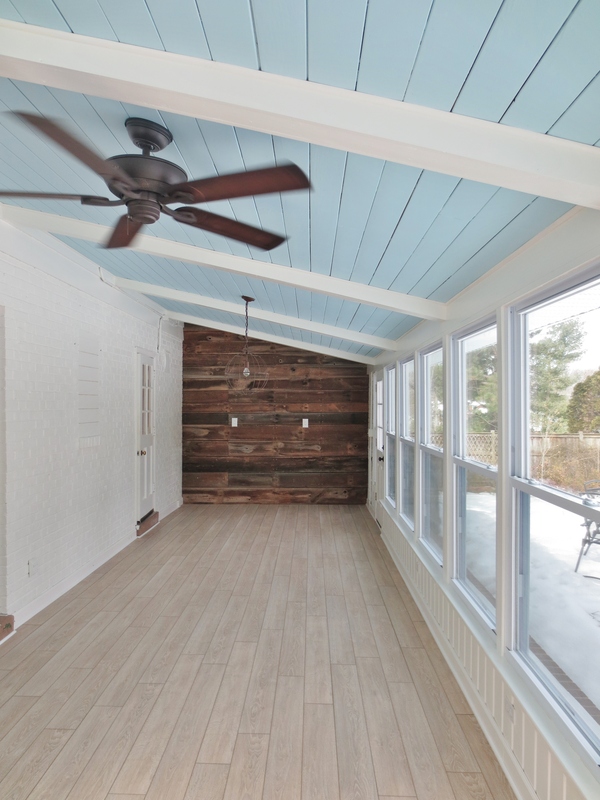 Here’s the post with all the details about how we pitched the roof and installed the beams. 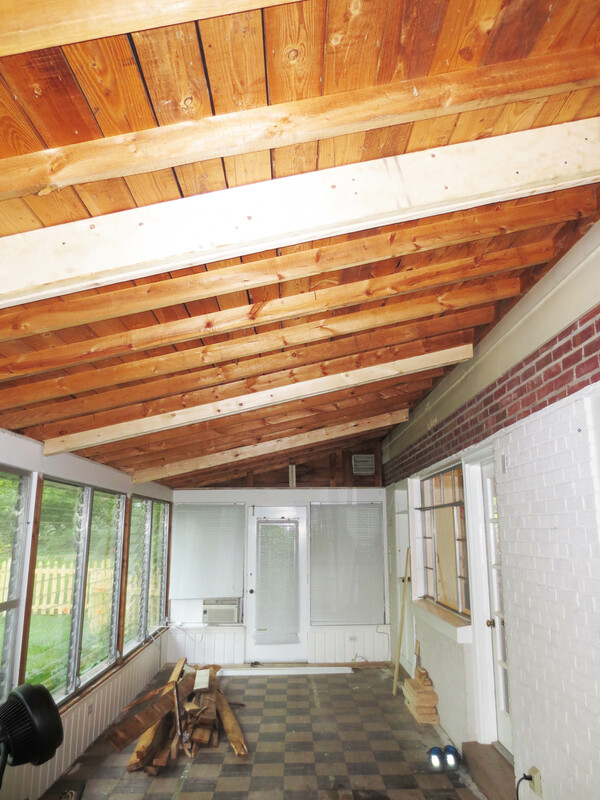 This is what the ceiling looked like after we took down the original drop ceiling and installed the new beams but before we put the ceiling back. 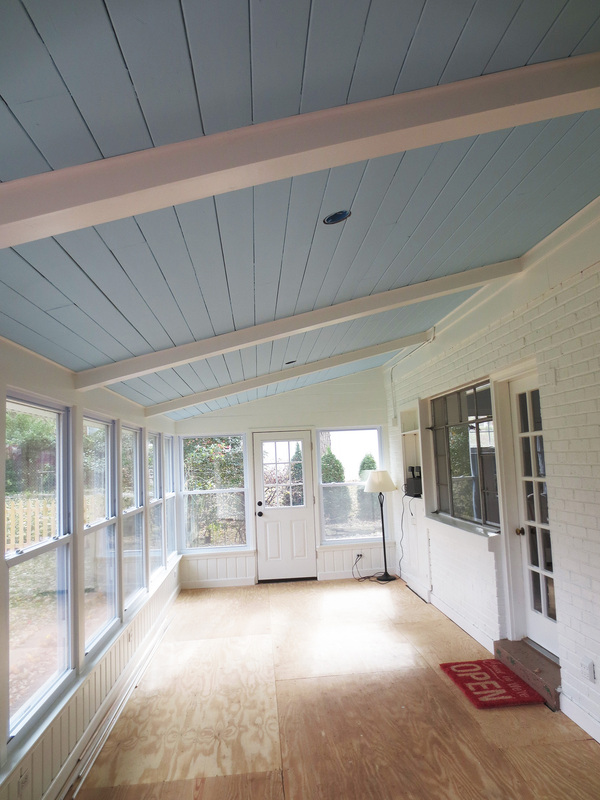 And here is the ceiling once it we insulated and put the boards back up, painted, and finished out the beams. 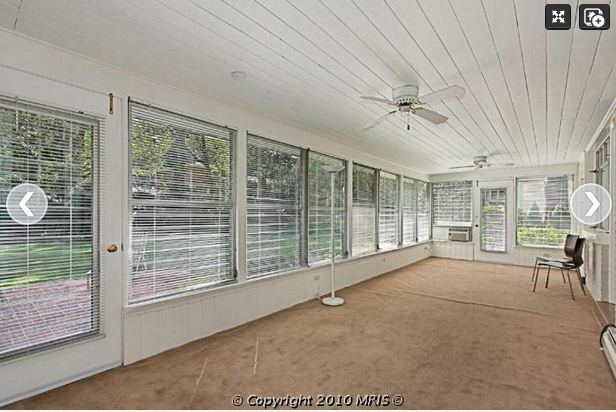 You’ll notice that the floor in this photo also looks different. 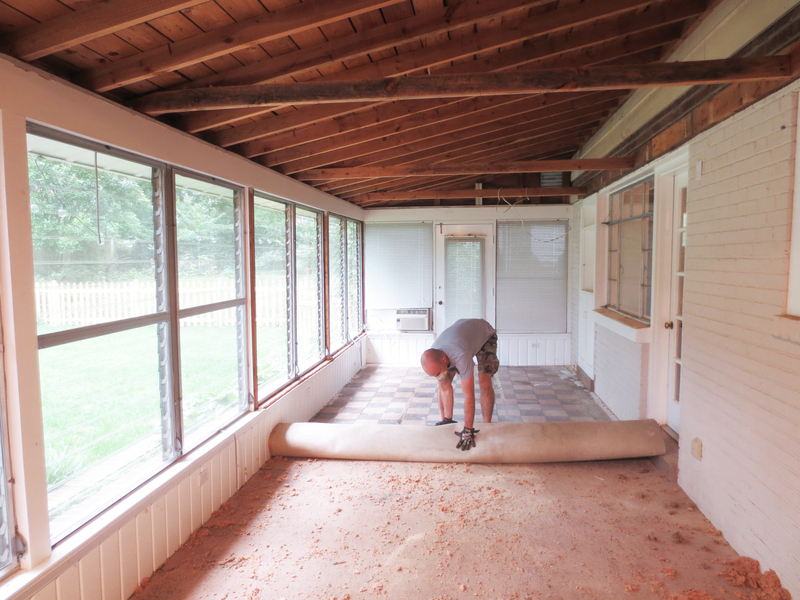 We started with carpet that had been laid (but not nailed or glued) over old tiles. 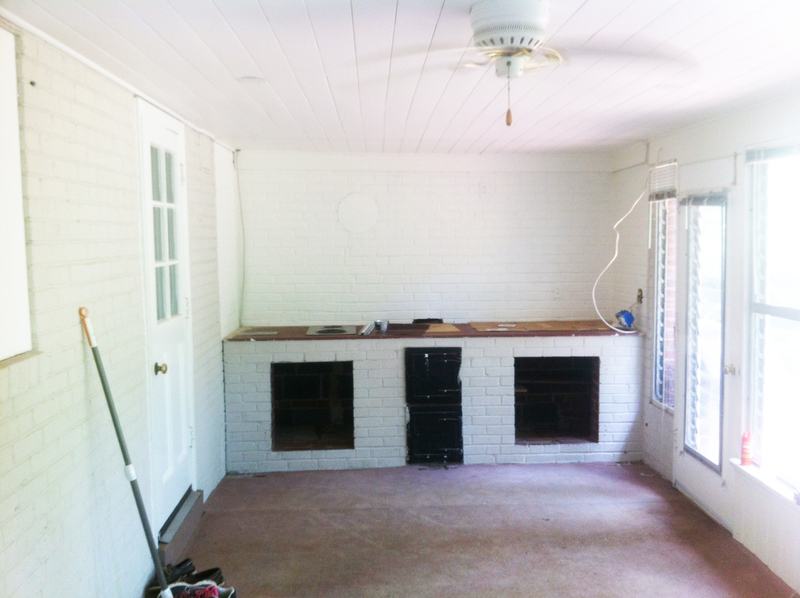 We removed the carpet and tile (that was a crappy job!) 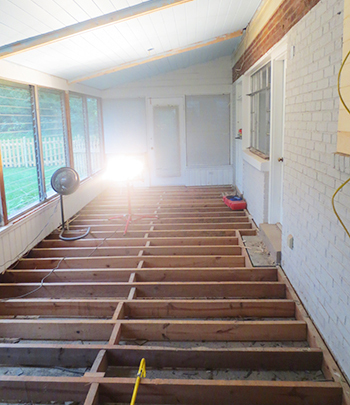 and then installed wooden subfloor which we lived with for 6 months or so until we installed laminate flooring. To get to where we were in this photo, we had to replace the old windows with shiny, fancy new ones and trim them all out. 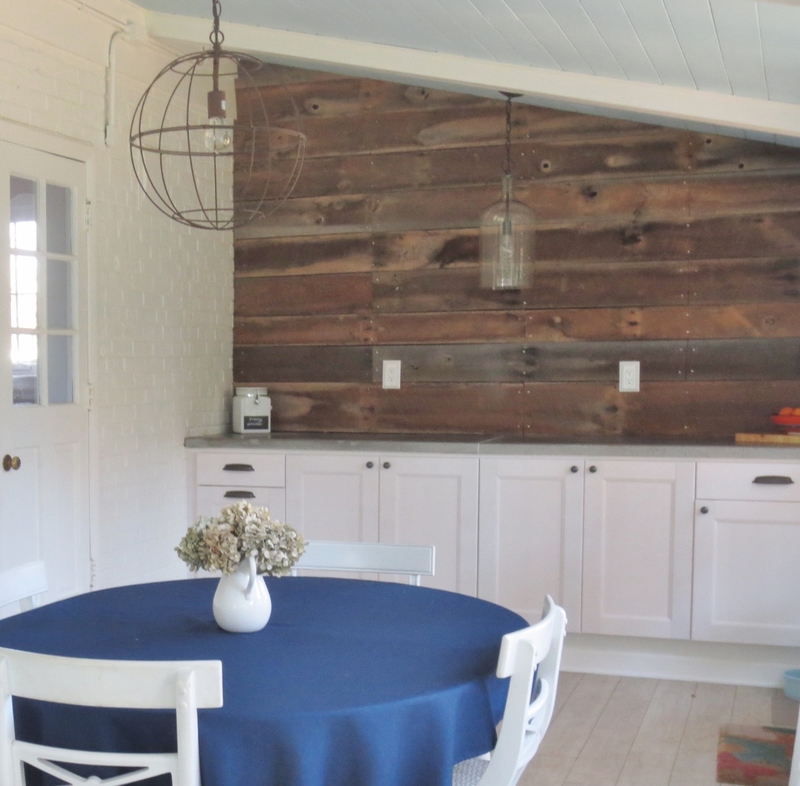 We also had to demolish the old outdoor kitchen (another craptastic job) and then install the barn board accent wall. Now things were starting to come together. This photo is taken just shy of a year into the whole project. After we got the floor down, we added curtains and then had the chairs recovered so they matched. Add in some other furniture and a new rug and one side of the room is in business. So much better than where we started! But what about the other side? 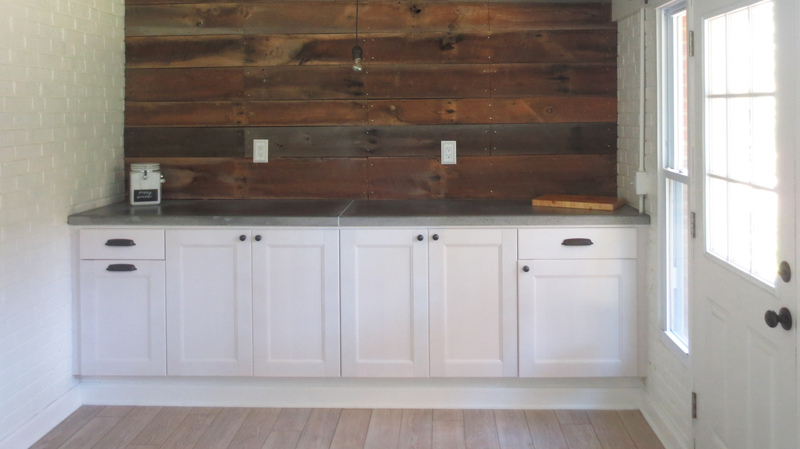 After creating the barn board accent wall, we installed a row of cabinets and then made our own concrete counter tops to create a bar area and extra kitchen storage. Again so much better than this. The last thing we did was buy this pendant from Shades of Light to replace the temporary bulb we had over the bar. The only finish option was chrome so we spray painted the chrome parts with Oil Rubbed Bronze spray paint, put the sucker back together, and hung ‘er up. Then we high-fived each other on a job well done. Now all that’s left to do is enjoy this room! To those of you (hi mom!) who have followed along the past 17 months, thanks for sticking with us. We’re very proud of where we ended up, even if it did take awhile to get here. So what’s next, you ask? Well that’s an excellent question. We have some smaller projects in the queue for the next month or two. Some rooms are getting painted and of course, I will share my holiday decorations. After the first of the year, we are going to start thinking about the big kitchen reno and possibly also widening our driveway. Both of these jobs will be decidedly less DIY than this sun room, but hopefully that means things will move a little faster. I can’t imagine not having a kitchen for 17 months! So what I am saying is, fear not. 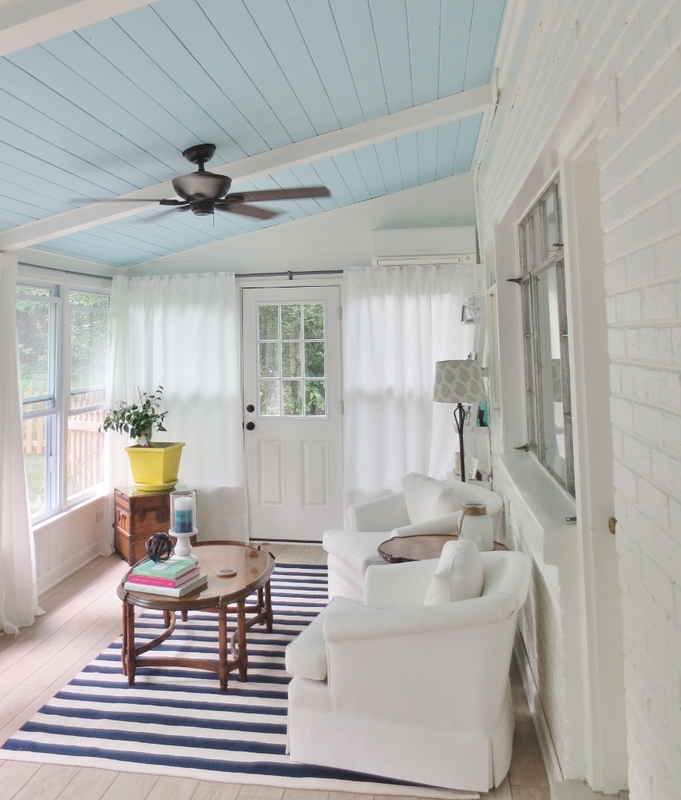 There’s more home updates on the horizon! Yay, old houses! 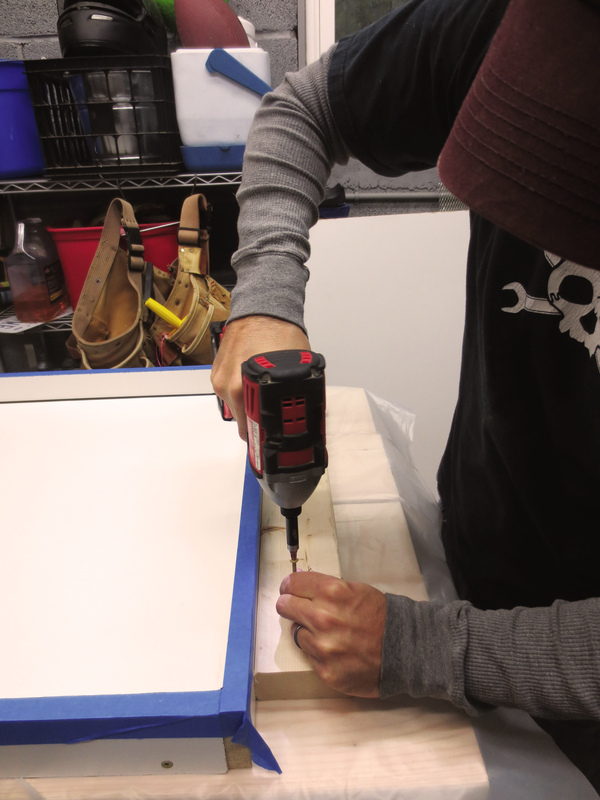 If you missed part one, click here to read about measuring and creating the molds for the counters. 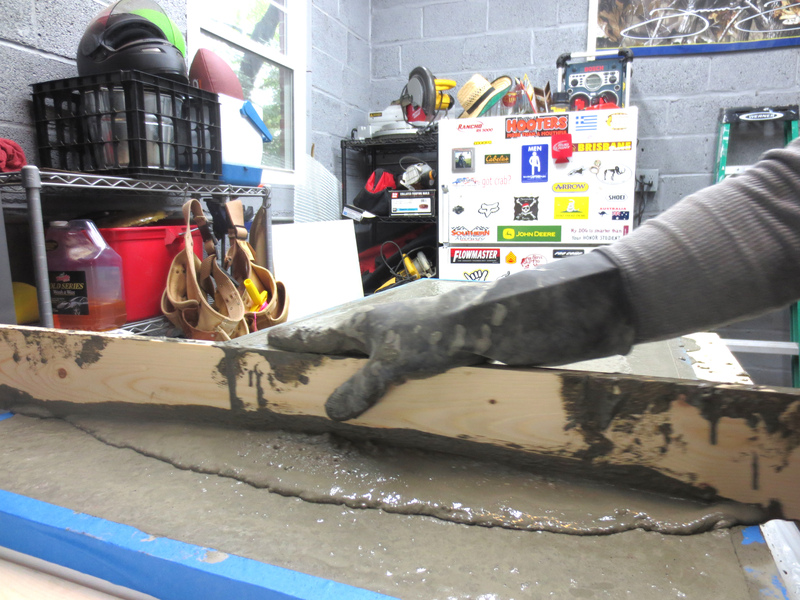 Before we started mixing the concrete, we attached 2x4s to the sides of the molds to prevent the melamine boards from bowing to the weight of the wet concrete. Then we wiped down the molds with a lint-free cloth to remove any dust. Jessi and Mike at Imperfectly Polished ordered and used a release agent on their molds to help ensure that the counters slide right out once they are dry. We decided to use cooking spray rather than order, pay, and then wait for a specialty product. 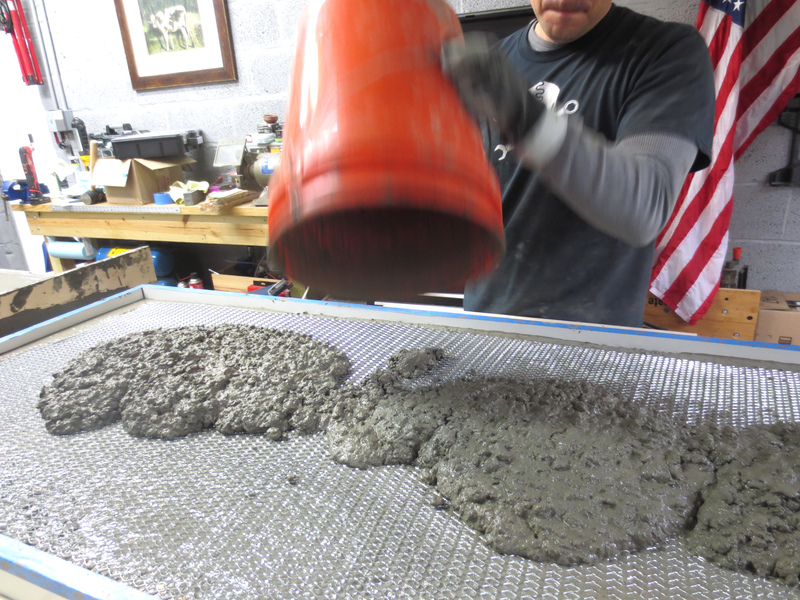 Once the molds were completely prepped, we began to mix the concrete. 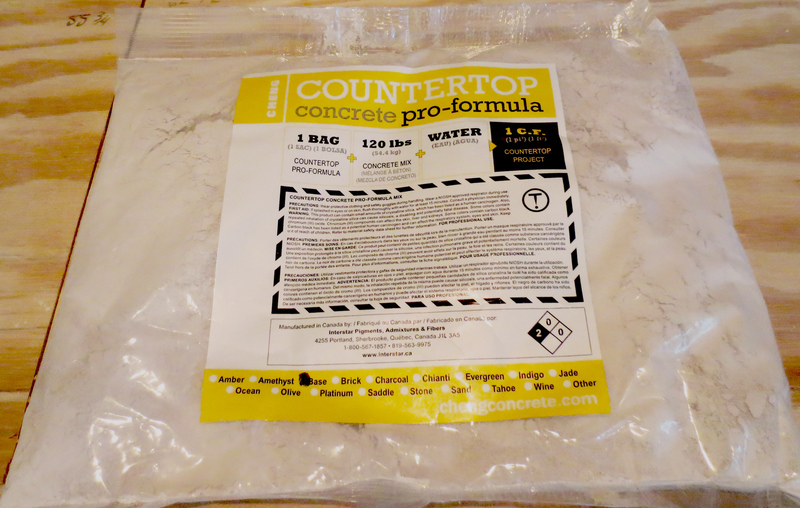 Some home improvement stores either carry or will special order Quikrete Countertop Concrete Mix, which is specifically made for thin applications like counter tops, but our local stores would not. We literally checked not only our local stores but also ones in Maryland and North Carolina as well. So we used the Sakrete 5000 Plus, which Cheng recommends, along with this additive that provides additional strength to the concrete. This is the additive from Cheng. 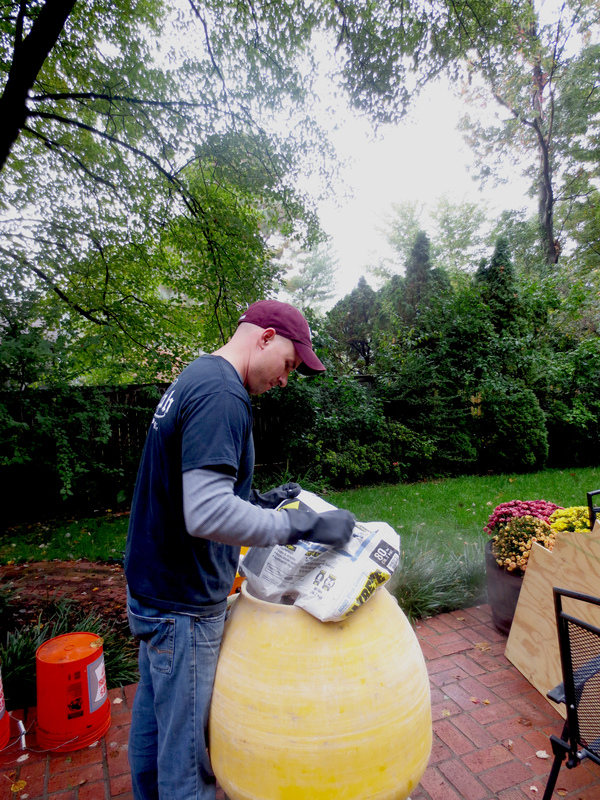 As you can see, we needed to mix one bag of additive per 120 lbs of concrete. However, the concrete bags are 80 lbs so that meant it was time to do some math. The mixer will hold two bags of concrete (or 160 lbs) so we determined that for every batch of concrete we mixed, we needed 1 1/3 bags of additive. So I measured out two bags of additives into thirds. 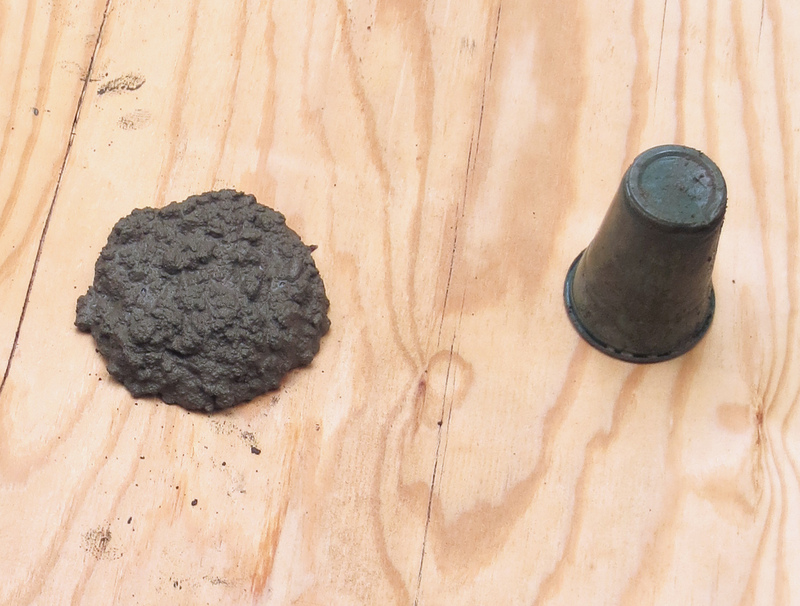 The photo below shows four of these because that’s how many batches of concrete we planned for. The additional 2/3 of a bag was extra in case we needed it. Cheng says to use 1-1.5 gallons of water per 120 lbs of concreteand then add a cup of water at a time of the mixture is still too dry. This meant more math. We poured a 1.25 gallons of water into a clean bucket and used a sharpie to mark a line where the water was so that we would know how much to fill for each batch. So we started our first batch in the mixer with 160 lbs of concrete, 1 1/3 package of Cheng additive, 1.25 gallons of water and got to mixing. Once the concrete was mixed, we thought that it still looked a little dry so we added one more cup of water, per Cheng’s instructions. Big Mistake. Here’s the biggest lesson we learned: a little water goes a looong way! To test to consistency, we used the “slump test.” You cut a hole in the bottom of a plastic cup and then fill it with the concrete mixture. Then you place the cup upside down on a flat surface and life the cup up. The concrete shouldn’t settle to more than half the height of the cup. This photo is from our first batch when it was too wet. Unfortunately, things moved too fast for me to get a picture of the right consistency, but you’ll get the idea if you do your research ahead of time. Once we had to consistency right with batch two, it was time to transfer it to the buckets and get it into the molds. We decided to mix the concrete on our back porch because it is raised and the step would make it easier to fill a bucket from the mixer. We set up the molds on saw horses in the garage, however, #1 because the garage is covered and #2 because it’s important that the molds are level. 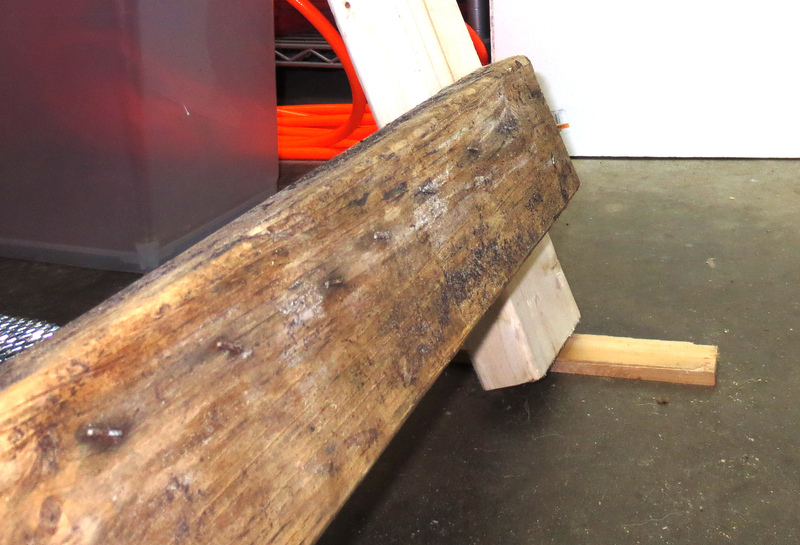 By using the saw horses, we could apply shims under the legs where necessary in order to ensure the molds were level. We set 2×8 pine boards on top of the saw horses to create a firm surface for the molds and then covered them in plastic so they wouldn’t be ruined. Once we got the mixed concrete into the buckets, we carried them into the garage and dumped them in to the molds. Okay, strong Mark did all of that. I opened the gate. 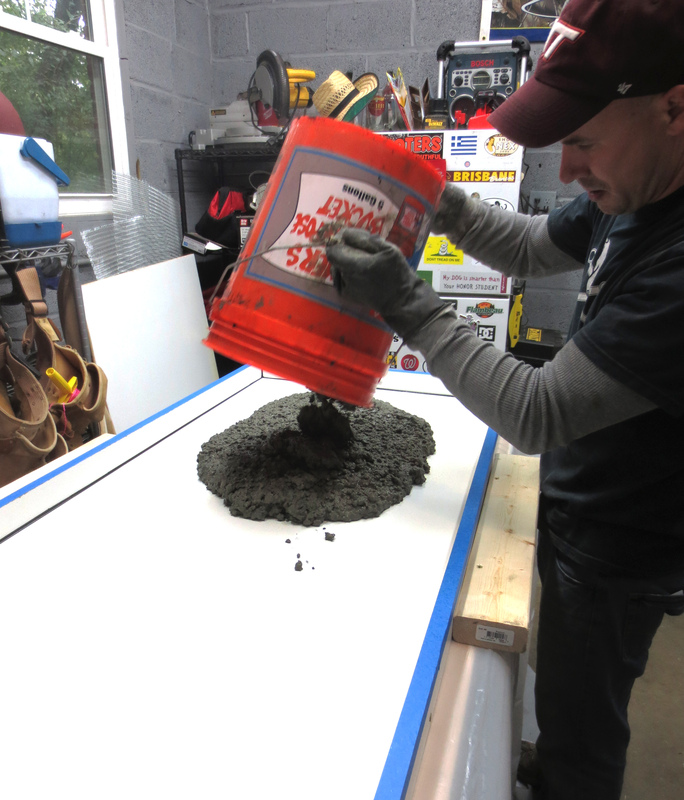 Once the concrete was in the molds, we used our hands (which were covered in heavy duty plastic gloves) to spread the concrete around and get it even and into the corners, like you would do with brownie mix after you pour it into a pan. One batch of concrete filled about half of one mold. Once we had it spread out, we used a rubber mallet and an oribital sander to try and pound/vibrate out all the air bubbles in an effort to reduce the amount of holes we would have to patch once they dried. 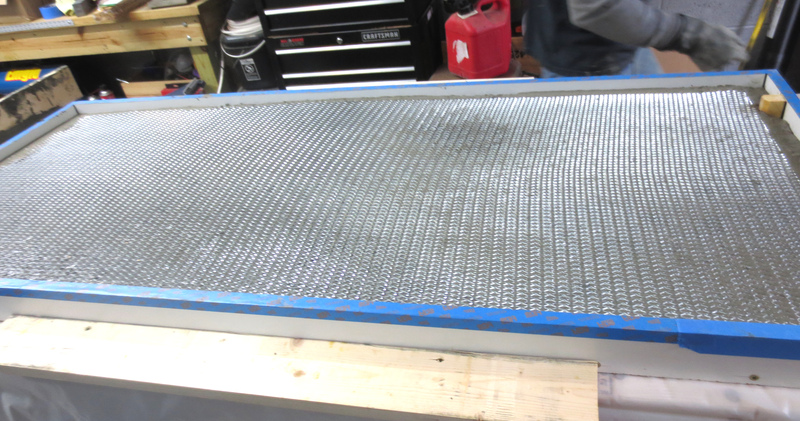 Then we added some wire mesh (which you can find in the concrete section of your home improvement store) for strength before mixing and pouring a second batch to fill mold one. 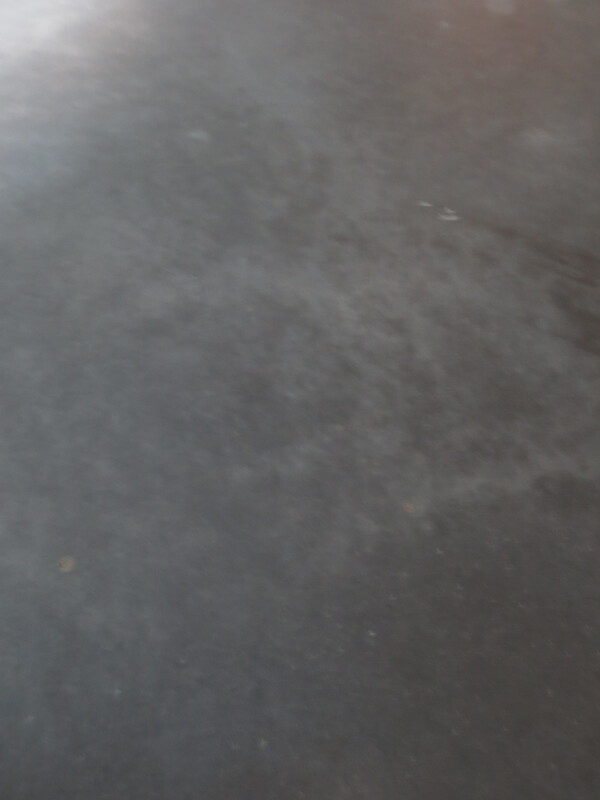 See how much wetter the concrete looks? This stuff is strange to work with, for sure! With the second batch, you need to do more that just even the concrete out with your hands. You use a board to screed the concrete to ensure that’s it’s level. Like in the photo above. 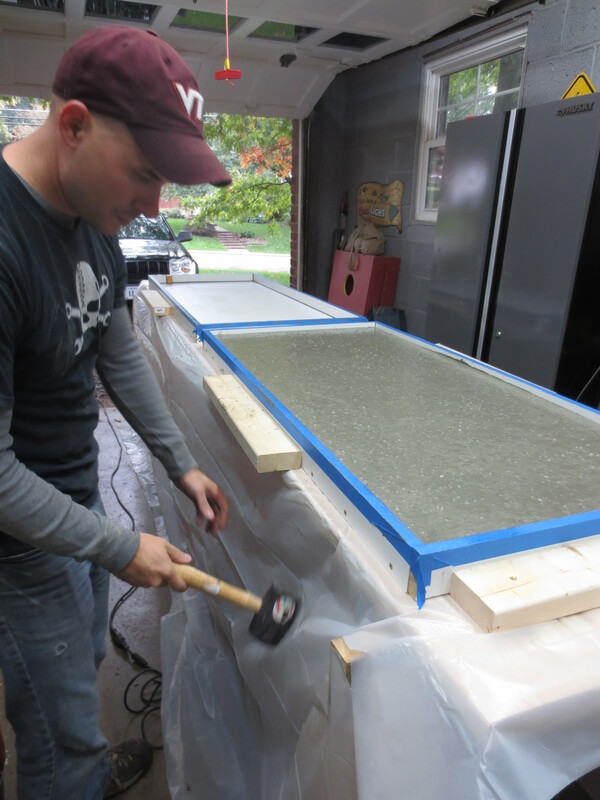 We repeated these steps with mold two and were delighted that we were able to fill both molds with exactly 4 batches of concrete, one less that we had anticipated. 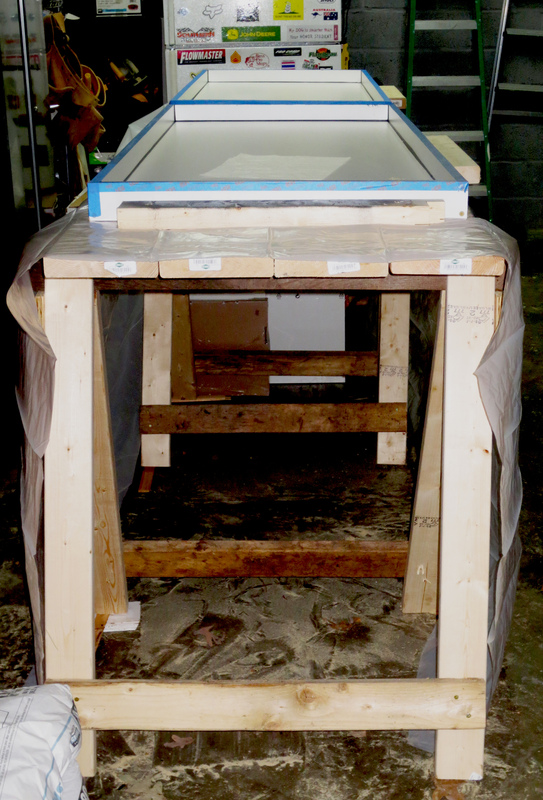 We covered the molds in plastic, said our prayers and left the molds to dry. Apparently I was too exhausted at this point to take any “finished” pictures. We dried the molds for one week. Apparently you can remove the molds after 24 hours, but we decided just to wait a week as it really takes about a month for them to gain their full strength and we weren’t going to be able to install them until the following weekend anyway. That week was very wet and damp so we started running a fan out in the garage about halfway through to help with the moisture. With the help of some friends we removed the molds and turned the counters right side up. we were pleasantly surprised that there were no air bubbles to fill and a little shocked at how different they looked than the ones Jessi and Mike made. Theirs seems to have more speckles and ours had veining. Ours also seems much darker. At first, I wasn’t sure about it, but as I looked at them longer, I started to like what I was seeing. Because ours ended up being so smooth with no air bubbles, we skipped the sanding (we were not sad about that) and just went straight for the sealer. 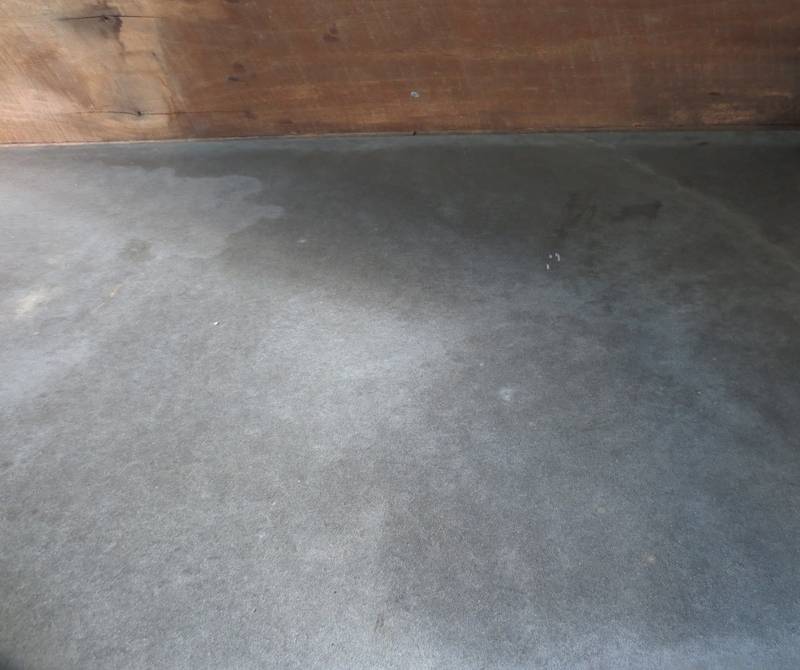 We used Cheng’s sealer and applied two heavy coats. Installing them took the work of two strong men and several tools. Mark and a friend were able to carry them from the garage into the sun room and slide the first one into place no problem. The second one, as we expected, was a bit more of a challenge. Brick had to be shaved and there was a crow bar involved but they eventually got them into place. We sealed the seam with concrete adhesive and gave it a coat of carnuba wax (which is food safe) to lock in the sealer. And that’s it! Total cost was $362.00 (see breakdown below). That ends up being just about $18.00 /sq ft. Considering that granite starts at about $50.00 / sq. ft., I would say that’s a good deal! Since it took me a few weeks to finalize this post, I can report that we have had some issued with water rings leaving stains. Apparently, this is a somewhat common problem without great solutions. 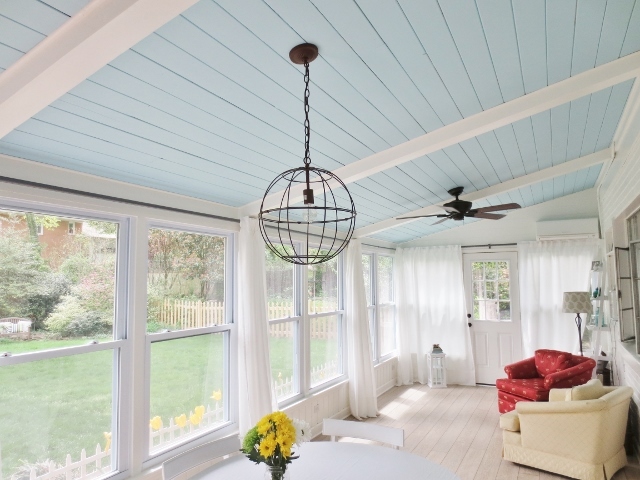 But since this is in our sun room and not our kitchen, we are ok with them having a “patina” look. 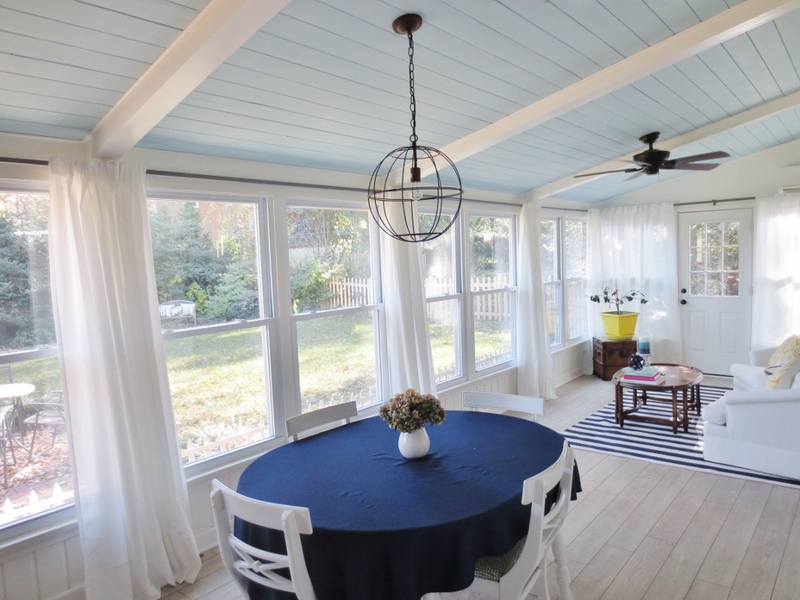 And with the completion of this project, we have officially finished our sun room renovation. I can’t wait for the big reveal post with all the amazing before-and-after photos. I will have the for you soon I promise!